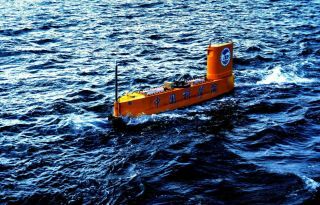 China's first uncrewed semisubmersible vehicle, as seen at sea in Bohai Bay near Beijing in June 2017. Although the tests were conducted in 2016 and 2017, a paper describing the results of the first tests with the system has just been published. Traditionally, it's been difficult to study the three-quarters of the Earth's atmosphere that is found over water, because scientists have needed to do so from planes or ships, both of which make for expensive expeditions. These endeavours are also usually more vulnerable to inclement weather compared to land-based observations. Sounding rockets make brief flights through different layers of the atmosphere, in this case carrying meteorological equipment as high as 5 miles (8 kilometers) above the ocean. "The unmanned semisubmersible vehicle is an ideal platform for marine meteorological environmental monitoring, and the atmospheric profile information provided by [sounding rockets] launched from this platform can improve the accuracy of numerical weather forecasts at sea and in coastal zones," co-author Jun Li, a researcher at the Institute of Atmospheric Physics of the Chinese Academy of Sciences, said in a statement accompanying the new paper. Now, with these initial tests of the system complete, the team hopes to deploy a network of these boats, particularly in order to study typhoons, the equivalent of hurricanes in the western Pacific Ocean. They also hope to equip the boats themselves with more-advanced oceanography sensors, so the vessels can look down as well as up. The test launches are described in a paper published today (Jan. 31) in the journal Advances in Atmospheric Science.